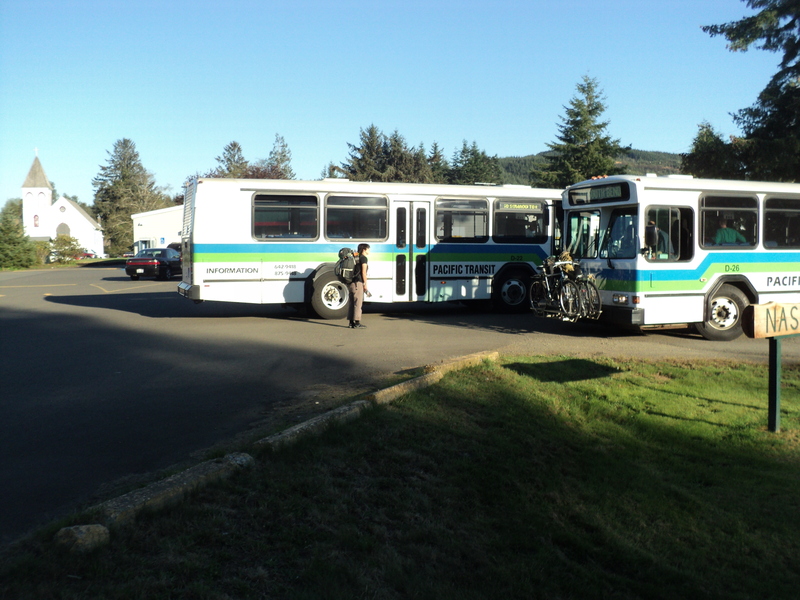 Little known to daily commuting bus riders in the Pacific Northwest, a web of interconnected bus transfers one to ride the public bus from Lund, British Columbia to Eureka, California with little interruption! We started our travels in Sammamish, WA and rode King County Metro to Sound Transit. 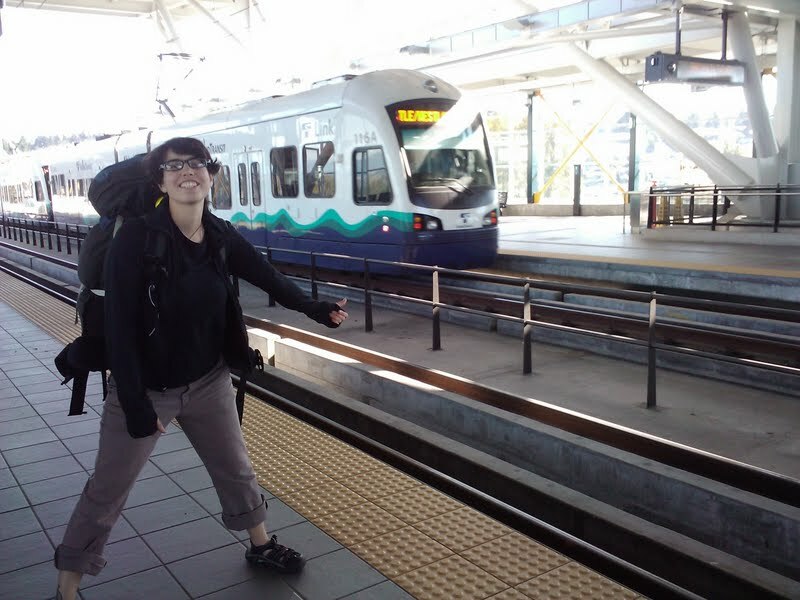 Our goal was to make it to the Washington coast by sundown and eventually to Chile by public transit! But first, we had to escape suburbia by bus! This was one of the most expensive segments on our trip because the transfer policies of Metro and Sound Transit forced us to keep buying a ticket for every bus ride, no matter how short. After paying 6 different fares to Sound Transit and Metro to travel from Sammamish to Lakewood, we realized a taxi might have been cheaper. We were joking that it is easier and more economical to drive in Seattle, until we realized that it was not a joke. The buses, scenery, and passengers became increasingly rural as we rode through Olympia, and Montesano, headed to the coast. We spent the night with Cousin Zach and Mary, who hosted us for a great evening! The transfers between agencies are great, but not very well thought out. The state of Washington and Oregon would be wise to invest in these existing transfers and encouraging neighboring transit agencies to coordinate their schedules. Right now, the state of Washington funds a Greyhound style service that duplicates these rural bus transfer routes. Several times one long distance bus would arrive minutes after the continuing bus had left, stranding folks to call friends and family. We would try to leapfrog some of the transfer gaps by hitchhiking at the bus stops and get ahead of the next bus. These rural bus networks are such a valuable resource, depended on by many people. The ability to ride buses from Vancouver, BC to California should be celebrated and promoted. Unfortunately, this great network is stymied by lack of schedule coordination between agencies. We rode 101 South, watching the coast from our bus seats. Some of the rural bus drivers like to play classic rock on their routes and we would not rock out with them in our seats! We rode each bus to the county line and would transfer to the next county’s bus service. After 4 days of leisurely travel on buses and hitchchiking, we had made it to Crescent City just in time for their biggest party of the year. It was the Crecent City Motor Truck Rally Weekend! The entire town was filled with big trucks speeding around downtown, squealing tires and burning rubber! 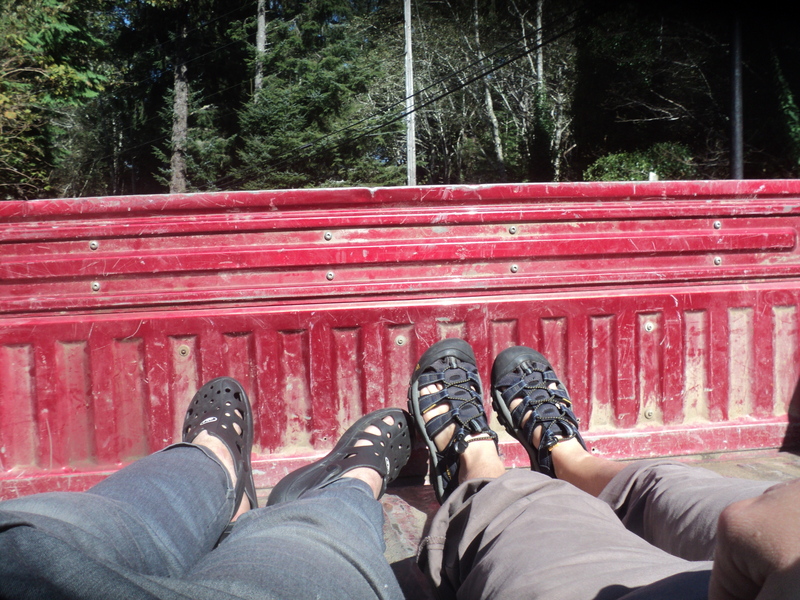 Riding in the Back of a Pickup Truck!